The media tablet market did not exist in early 2010. But now, millions of workers use these tablets in the enterprise every day, and the tablet market is just the tip of the mobility iceberg. Just below the surface lies a torrent of innovations that includes mobile applications, social media, mobile health, cloud computing, mobile payments, interconnected machines, mobile collaboration and wireless technologies. Lately, when developing a mobile strategy, Enterprises have caught on to the fact that BYOA (Bring your own App) has gained just as much importance as BYOD – due in part to the fact that apps procured via public app stores can cause all kinds of issues around security and procurement. Also, the proliferation of mobile devices has become so universal that the phrase “mobile-first” may be ousted by “mobile only” in the not-so-distant future. Granted, it won’t happen all at once, but 2016 is undoubtedly half way on course to become the year of mobility. According to Business Insider, there may be as many as 34 billion connected devices by 2020. Not all of these devices will necessarily be mobile; however, many of them will be controllable and customizable via applications meant for smartphones and tablets. Mobile application development was therefore tasked with a new objective in the early 2016: to design easy-to-use dashboard interfaces for mobile. Everything is good and pacing in the mobility space so far. Mobile continues to gain traction in the enterprise, as both IT and line of business need to contend with how they will serve employees, partners and end-user customers. CIOReview understands the emerging importance of Mobility and why it must be introduced as a transcendent for wannabe successful organizations. Being closely scrutinized by a distinct panel of judges including CEOs, CIOs, CXO, analysts and CIOReview editorial board, we present to you 20 Most Promising Enterprise Mobility Companies. These vendors drew our attention not just because of the innovations and solutions, but also because of their experience and fail-proof methods to evaluate the correct mobility strategy for enterprises seeking for it. 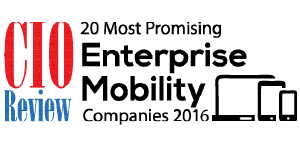 We present to you CIOReviewindia 20 Most Promising Enterprise Mobility Companies - 2016. 1 Mobility Helps to take control of security policies on mobile devices, Manage risk of enterprise data & Intellectual Property and Increase productivity & modernize infrastructure. Avani Technology Solutions Delivers Enterprise Mobility assessment, planning and implementations, SAP Enterprise Mobility Solutions, Custom apps design & development, Enterprise mobile security & testing. Clay Logix India A provider of Data Management, Business Analytics, and Mobility solutions with experience in database technology, database migration methodology, and related tools. Crave Infotech Provides specialized custom solutions that include Mobile Field Service Manager, Field Routing, Mobile Field Tracking, Transport Management App and Google Map Integration. Hexlog Infotech Deploys solutions like IT Consultancy, Application Services, Enterprise Applications and Website Solutions. InnovationM Avails consulting, design & development services in the mobility space to build mobile solutions for Android, iOS, Windows Phone as well as HTML5-based mobile web solutions. Integration Wizards Solutions Facilitates cloud based mobility platform with Business Application suites that are prebuilt and customizable allowing enterprise to deploy these to the field. Intelligentia IT Systems Renders Mobility Consulting, Mobile App Development, Mobile App Testing, Mobile Device Management and Support & Maintenance. IVY Mobility Provides integrated mobilization solutions into customer’s existing back-end systems, irrespective of the platform or the mobile device. LinchPin Technologies Proffers solutions like iPhone App Development, SEO, Android App Development, Windows App & Development, Web Development -HTML5/JS/CSS, and Web/UI Designing, Sharepoint. Magic Software Provides solutions for Application Platform, Integration Solutions, Cloud Computing, Enterprise Mobility, Integration Platform, Digital Transformation and Enterprise Mobile Apps. Mobien Technologies Extends solutions like Enterprise Mobility Solutions, Enterprise Mobile Applications, Mobile Apps and ERP Extensibility. Mobtecnica Consultancy Designs Enterprise Planning, Monitoring & Management solutions, Mobile Application Development solutions for Android, iOS, Blackberry and Windows Mobile. Sify Technologies Designs solutions for ICT, MPLS, Wireless , fibre broadband, Network management, Enterprise Cloud, IT Security, private , public cloud and IaaS, PaaS, SaaS. TechJini Solutions Provides Enterprise Mobile Product Engineering solutions & services to iOS, Blackberry, Android, Web Application Development and Windows Phone 7 Platforms. Tresbu Technologies Furnishes solutions like Enterprise Mobility, Cloud Solutions, IOT, Outsourced Product Engineering, Web 2.0 Enablement, VOIP/Telecom and Ecommerce-Magento,PHP,Zend. TVS Next Delivers Enterprise Planning Services, Operations Excellence, Testing Services, Digital Technologies, Mobile Application Development, UI/UX and Software Product Development. Web-Shuttle Delivers mobility services enclosing Web development, Mobile App development, software development and Corporate training.